Columbus, Indiana, is known for its legacy of midcentury, late modern, and postmodern architecture, most of which was commissioned by industrialist J.I. Miller and his pals in the 1950s, 60s , and 70s. While it is true that Miller is a “Midwest Medici” and hugely influential on the town’s success, it is best to understand the town’s design legacy not as a series of architectural “gems” that mark the passage of time like a museum—eight National Historical Landmarks and a collection of over 50 notable works by important architects—but rather as the embodiment of a living system of socio-political values that have come to define the town. It is often said that all political systems are most successful at a small scale: Their progress is most palpable and their systems less corruptible. In Columbus, this can be seen in the town’s almost-impeccable history of public-private partnerships, where a group of leading businesspeople and community leaders realized what could be seen as the American industrial capitalist dream—and along with it—at least a part of the modernist architectural project. Recently, a group of patrons (who of course know Miller and his legacy) and world-class arts administrators have come together to continue this tradition of design and community. This exhibition, called Exhibit Columbus, is a town-wide festival of design, including five large-scale architectural installations by winners of the inaugural “J. Irwin and Xenia Miller Prize;” a series of small design interventions along the main downtown commercial corridor; and several pavilions designed by local universities and high school students. This could be read as another “biennial,” or “Design Week” alongside the growing list: Seoul, Venice, Oslo, Chicago, Lisbon, Vienna, Eindhoven, Ljubljana, New York, London, Miami, Mexico City, Shenzhen, Beijing, Stockholm, and Milan. However, the first biannual Exhibit Columbus proved to be something different. For starters, the original name “Columbus Design Biennale” was abandoned because, according to Director of Landmark Columbus Richard McCoy, “we wanted to put Columbus’s history on display rather than explore the current trends in design.” This perfectly demonstrates how the primary focus of the event is not on engaging global discourse, but continuing and re-aestheticizing the design culture of the place by connecting the residents of the town. This might prove to be the best lesson from Exhibit Columbus: How to engage with the heritage of a place while pushing forward cutting-edge design. In this context, the word “continuing” is particularly important here, as it would be easy to look at this as a “revival” or a “renaissance,” where the legacy of Mr. Miller is exhumed from the grave by a new generation of design-minded leaders. However, the truth is that this mentality never really left, it has been influencing the town quietly ever since the first notable building was built. Columbus is an exception. It has a thriving economy with the highest percentage of its output as foreign exports, as much as 50 percent, according to the Washington Post. It has not seen the Rust Belt-ification of many of its neighboring towns, because local Fortune 200 company Cummins Inc., an engine manufacturer, has somehow managed to remain an industrial giant in the American Midwest and abroad. (It is said that Mr. Miller was the first American to go to China when it opened up trade with the west.) Because the town never descended into a post-industrial dystopia, strong ties to the community and the spirit of collaboration and design excellence also never went away. The underlying phenomena of “The Columbus Way,” a community-based collaborative spirit, was always there—there was never a lack of leadership in the town, or a strong sense of community. It just needed to be re-aestheticized. This idea of continuation is best seen in one of the Miller Prize installations. Oyler Wu’s Exchange is sited at the Irwin Conference Center, which is currently owned by Cummins and used for corporate hospitality, but was originally completed in 1954 by Eero Saarinen and Associates as a flagship branch of the Irwin Union Bank and Trust. The one-story banking hall pointed toward a new type of modernist space unbound by walls and conventional banking architecture, such as cages for the tellers. Instead the new open-planned bank was bound by glass walls. 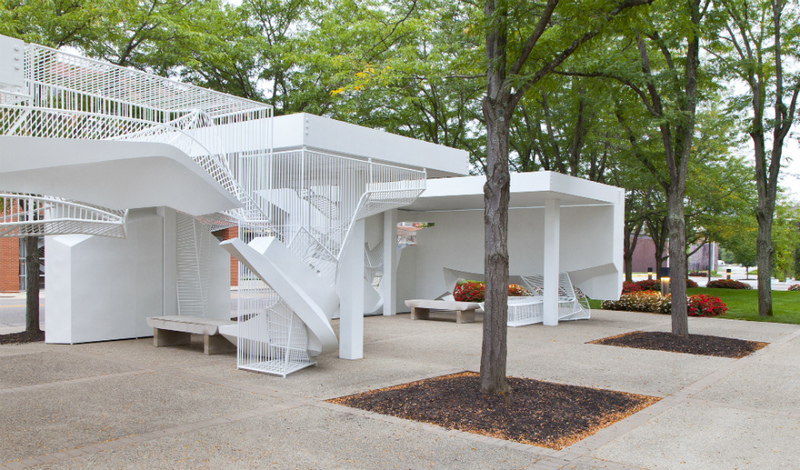 It would be easy to stop here and draw a connection between the white, contemporary forms of the 2017 installation—digital fabrication aesthetics made in L.A. and assembled onsite in Columbus—and the glassy Saarinen bank building, and read it as a sort of new language for Columbus: Less midcentury modern and more digital tectonics as a metaphor for a small Midwestern hamlet turned globalized 21st century networked town. However, there is more to the story than that. However, these canopies were not designed by Eero Saarinen, but rather by local architect Frank Adams in the 1980s. In fact, when the bank was completed in 1954, the site next to it was still Harrison Motors, an auto dealership. Later, as part of a 1966 Dan Kiley–led landscape extension, three manned teller booths were added in the adjacent lot after it was purchased from the car dealership. It wasn’t until 1973 that a three-story office building was completed by Saarinen’s protégé Kevin Roche of Kevin Roche John Dinkeloo and Associates. In the 1980s, the teller booths became pneumatic drive-up stations and the Adams canopies were added. A later renovation was completed by Columbus architect Todd Williams. 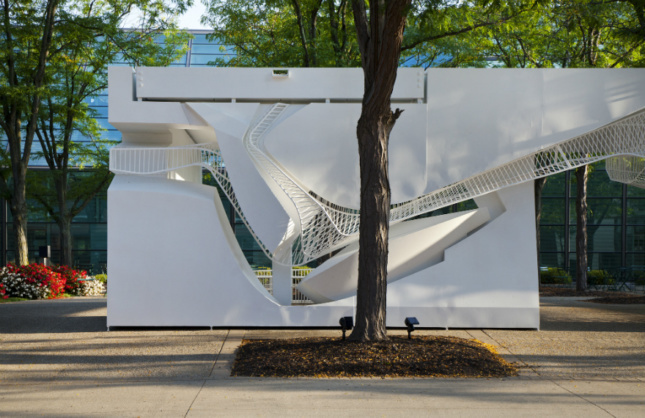 Considering this more complicated history of the site, it makes the most recent addition to the site, the Oyler Wu pavilion, even more poignant. It is not just Oyler Wu and Saarinen in a clean past-present relationship. It is a literal and figural continuation of myriad complex issues and histories in the town. 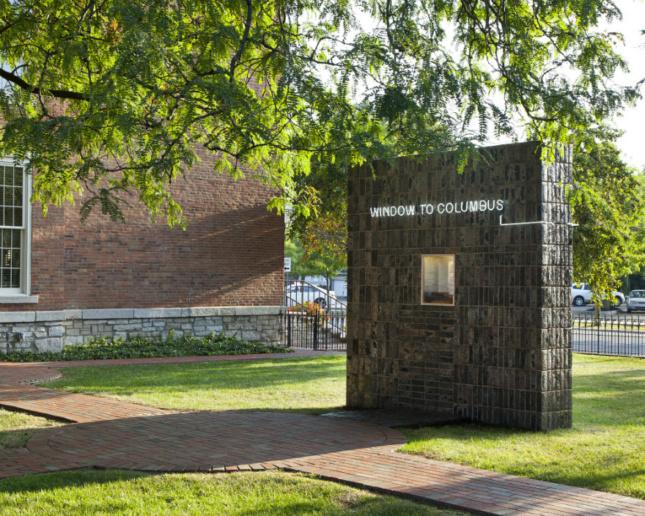 It—and Exhibit Columbus—is an extension and re-aestheticization of something that never left. The canopies, walls, and benches of The Exchange almost grow organically out of the existing structures, continuing the evolution of the site from an autoyard to a car dealership to a bank to a conference center and then finally to a small urban parklet. Not only does the form continue to complete the implied volumes of the canopies, but it updates the use of said structures into a viable place for urban respite along a main pedestrian thoroughfare. It is certainly a new aesthetic for Columbus, as Oyler Wu’s style comes through in the welded steel forms that mingle with CNC bent steel tubing. Transparent volumes capture space that is suspended in the air, allowing us to see what was already there, but in a new frame—like Exhibit Columbus itself. So what is the impact of Exhibit Columbus and its continuation? For the locals, it is about education and a re-engagement with the design heritage and legacy. But the exhibition can’t escape being relevant globally, and it has much to offer as a living, urban laboratory. If we look to some of the more forward-looking design events: The 2017 Shenzhen Bi-city Biennale of Urbanism\Architecture and its examination of the urban villages in the hyper-local yet hyper-global context of Shenzhen, The Istanbul Design Biennial 2018 and its questioning of the biennial as a site of education, and the Open Design School at Matera European Capital of Culture 2019, where the curators will try to start an academy that they hope will harness the after-effects of a global cultural event in order to invigorate one of the poorest regions of Europe. Some may not want to admit it, but Columbus is now back in its rightful place in discussion with these large global cities, as it has been historically for both design and business reasons. Today, Exhibit Columbus shares DNA with all of the aforementioned projects. How does it uniquely engage with the local community? What will be its immediate and long-term impact on the community, the economy, and the students of the town? 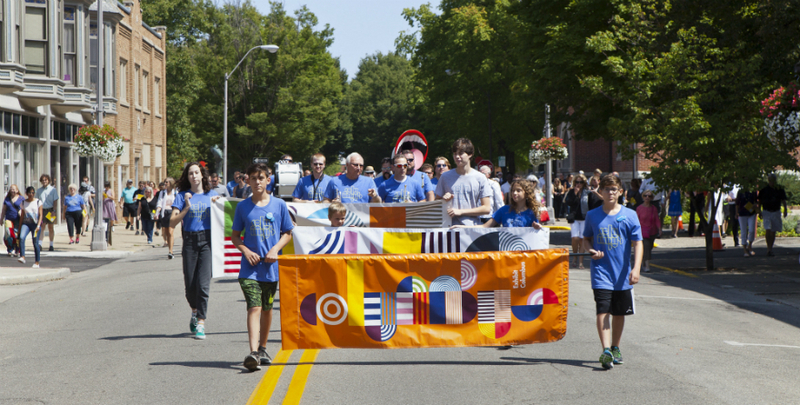 What can we learn from Columbus’s attitude about design and community? What new forms of knowledge might arise, or what new forms of design can come from such an important and rich context? What are the new challenges Columbus faces as its demographics change and what opportunities are there to incorporate these new identities into the heritage of the place? Exhibit Columbus is positioned to be a unique voice among many voices in the cultural events sector. Based on the reactions from the community at the opening, and the sustained efforts of McCoy and his team over the duration of the exhibit, it has revived the design heritage of Columbus. “There was a hum that emerged from the exhibition,” Columbus resident Mary Harmon told AN, “What I have really loved is that there was something for all ages, interests ……….ranging from tots to the elderly and those with a knowledge, curiosity and fondness for art and architecture to those who could care less, but felt happier just walking by and seeing the people out and about.” Of course, it can still be improved upon, and it will be a site to watch for those interested in how cultural production can interface with a local community, and even become an integral part of it and its mission to make a place better through architecture and design. Thanks to Will Miller and Enrique Ramirez for their editorial support on this essay.